So you’ve built yourself a fancy new PC. It has a strong CPU, monster graphics card and it should be running like a dream, except it isn’t. Your programs are slow to start and laggy when they do. If this sounds like you, the bad news is that your hard drive is too slow to keep up, but the good news is we’re here to highlight some of the best, fastest new SSDs available, ones which make use of the M.2 connector to enable speeds that leave your old HDD behind in the dust. We know this stuff can get confusing fast, so we’ve tried to explain in a fairly simple way so that you can spend less time looking up acronyms and more time thinking about which is the best M.2 SSD for your needs. Below, you’ll find a table which shows all of the products we’ll be reviewing, plus a couple of their most important specifications. There’s a good mix of SSDs in there, so we’re certain that one of them will be perfect for you. Now that you’ve had a quick look at our top recommendations, let’s take a closer look at each of them individually. We’ll be looking for any strengths or weaknesses that each model has and highlighting the person that it would suit best. That said, let’s begin with the Transcend MTS800. Given that M.2 SSDs are pretty new technology, it’s surprising to find a model as inexpensive as the Transcend MTS800. For under $70, you could be on the frontline of the digital storage revolution! 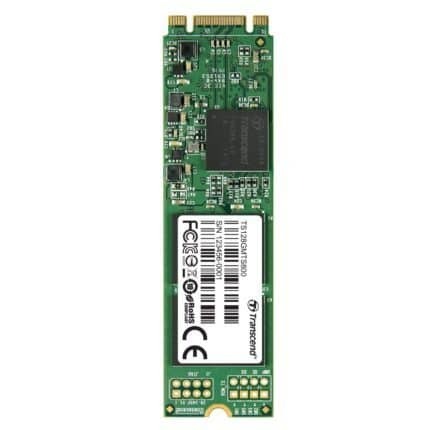 Whilst some M.2 SSDs use a PCIe connector, these tend to be more expensive and as a result, this one relies on a standard SATA III connection, which means that it has speeds comparable to a standard SSD. The maximum read speed is around 560MB/s and write speed is around 310MB/s. That’s fast enough to copy a standard movie in around a second and a half. It does have one distinct advantage though – this model is much smaller than your traditional hard drive or SSD, measuring just 3.15×0.87×0.14”. This makes it perfect including in mobile devices like laptops or Raspberry Pi projects where a lot of storage is required (although you will need a SATA connection if this is the case). It weighs almost nothing, too – just under a third of an ounce. With standard SSDs weighing around a pound, you’ll likely notice that your devices are lighter with this installed, which is never a bad thing. This SSD has Power Shield technology. Basically, if the power is cut and you’re using a normal SSD, there’s a chance that it won’t have enough time to clear its cache, which can lead to corrupted data or even a broken drive. With Power Shield, though, tiny capacitors build up electrical charge which buys the SSD a little extra time to flush the cache and ensure that shutdown goes smoothly. This is a little feature that could save you lots of heartaches, especially if you need to store a lot of important information. It also supports Dev Sleep mode, which is an ultra-low power state somewhere between sleep mode and normal usage. This allows you to conserve battery power whilst ensuring that it’s usable when you need it in a hurry. That’s not all! The status of this SSD can be monitored using S.M.A.R.T. technology which allows you to see whether your drive is likely to fail before it actually does, giving you precious time to back up your data. You can also use the TRIM command to wipe blocks of memory that aren’t in use, similar to defragging a traditional hard drive. Additionally, NCQ is supported. This gives the SSD the ability to process read and write tasks simultaneously, decreasing latency time. Transcend offer a free SSD monitoring tool called SSD Scope, and we’d recommend installing this as it provides a whole lot of useful diagnostic information, but also because it shows the current wear level of your drive. They do provide a three-year warranty, which is a pretty good length, however, if you manage to wear the drive down completely in this time, you won’t be covered if something goes wrong. Thankfully, it takes some pretty intensive use for this to happen so unless you’re transferring terabytes of data regularly, you’ll likely be alright. All things considered, this is a fantastic little M.2 SSD. 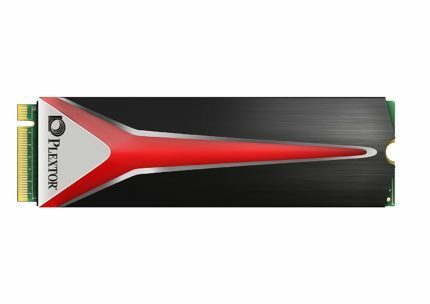 Whilst it cannot provide the speeds that a PCIe-connected model can, it make up for it by providing support for a number of invaluable functions and having such a low price. Whether you’re planning to use it for a project, want to strip excess weight from your devices or just want to see what all the fuss is about, the Transcend MTS800 is a great choice. 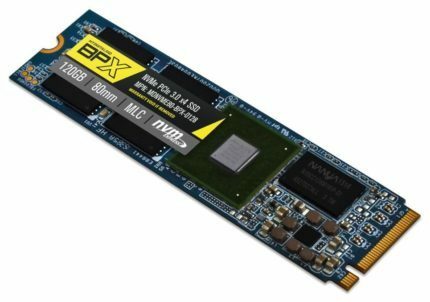 The BPX M.2 SSD from MyDigitalSSD is an exceptionally inexpensive product, made all the more attractive when you take its high data speeds into account. As it uses a PCIe 3.0 4x socket, it’s much faster than a SATA III based model, capable of reading up to 2.6GB and writing 1.3GB of data every second. These speeds are just not possible with a traditional SSD – the oft seen 6GBps older products advertise is the hypothetical limit and would rely upon a laboratory environment where everything worked perfectly, whereas this model regularly achieves the speeds it advertises. As such, it’s perfect for situations that rely on a lot of data being loaded quickly. Whether for commercial use in a data centre, or recreational use as a super-fast boot drive in your home PC, there are very few scenarios where this drive would be too slow. And yes, we said boot drive – many of the lower cost M.2 SSDs can’t be booted from directly and are suited only for everyday data storage, but as long as you have a spare PCIe 2x socket, you’ll have no problems booting from this model. The BPX also makes use of Non-Volatile Memory Express (NVMe) technology to improve its speed. This works by reducing the number of internal messages sent per transfer and using multiple data queues to simultaneously read and write. It also employs a SmartECC engine to reduce the risk of data corruption during high-speed transfers, and while this risk is already very small, it’s better to be safe than sorry. There’s also dual-layered power cut protection which uses Phison’s Smartflush to protect your data and fail-safe circuitry so that even if one component is damaged, it won’t completely destroy the entire SSD. Various security features are provided and rely upon a hardy 256 bit AES engine – this means it would take the fastest computer ever created almost ten years to crack one strong password on this SSD. As an added bonus, even if your motherboard isn’t the newest, you can still use this SSD as long as you have a PCIe 1.1 or 2.0 slot and a PCIe adaptor. It will have slower speeds, however, comparable to a SATA based drive. MyDigitalSSD includes a limited warranty with this product that covers you for either five years or until you write 175TB of data, whichever comes first (spoiler: it’s five years – it’d take you 95 years to write that much data, assuming you wrote 5GB per day). This is a pretty long reaching warranty, which goes to show the confidence MyDigitalSSD have in their products – always a good sign for a potential customer. Like the Transcend MTS800, this SSD is very small and slim, measuring 3.15×0.87×0.12” and weighing just 0.28 ounces. The size differences between the two are negligible, although the BPX has a definite speed advantage. It does require a decent cooling system though, as its temperatures often run above 122°F. MyDigitalSSD have confirmed that the product will be fine even at temperatures well above that, but for peace of mind, it might be easier for you to add an extra fan or two anyway. Overall, there’s a lot to like about this model. If you’re looking for an incredibly fast little SSD and you don’t want to spend too much money, this would be a great choice. Its strong security features, as well as its data protection technology, make it reliable enough to store sensitive information on and it’s even backward compatible so can be used on older PCs. For under $90, you can own an SSD that won’t be outpaced for years to come. The WD Blue is a mid-budget, 500GB, SATA III based M.2 SSD with a regal looking blue circuit board. It has an absolutely minimal footprint, so is perfect for use in a system where space comes at a premium. Like the two models we’ve seen above, it measures 3.15” long and 0.85” tall but is just 0.05” (1.27mm) thick. That’s a whole 58% thinner than the BPX and 64% thinner than the MTS800! It’s also slightly lighter, at 0.2 ounces, but to be honest, you won’t see a whole lot of difference since all of these SSDs are so lightweight. Since it uses a SATA based connector, its speed is limited compared to a PCIe-based model, however, if you’re upgrading from a traditional hard disk drive you’ll see increases in speed of around 400-500% with the WD Blue – it can read at up to 545MB and write 525MB per second. Usually, you’ll find that the write speed is significantly lower than the read speed, which is why it’s so rare to find an SSD that has such similar results. This SSD has an industry-leading lifespan too – it’s estimated to survive up to 200TB of data writing and has approximately 1.75 million hours of use before it fails. Don’t worry, that’s a little under 200 years of constant use, and frankly, this product will be a family heirloom by that point. In case anything goes wrong with the product, WD offers a three-year limited warranty and have a 30-day return policy on unopened products in case you change your mind. Three years is a pretty long time and if you make it that far without any issues, you’re unlikely to see any anytime soon, but we’re glad to see the customer being cared for in the long term. Once installed, this drive can be booted from and take our word for it, you’re going to want to use this for your operating system. Gone are the days of starting your PC up and going to boil the kettle while you wait– if your computer is in decent shape, you’ll be on the desktop in under 30 seconds, which means you waste less time and could even improve your productivity. WD provide a free download of their SSD monitoring software on their website, which is essential if you’d like to use this SSD for any significant length of time. It displays various useful information such as the temperature of the device, the amount of free space remaining and the wear level of the drive itself. This last feature is invaluable as it lets you know when the SSD is approaching the end of its lifespan and gives you a chance to back up your data before it fails. WD have tested this particular model to ensure that it works with the widest range of devices possible, which is great news if you’re unsure about your own hardware – as long as you have an M.2 socket, it’ll get the job done. We’re big fans of this SSD – it has a consistent read/write speed and is relatively inexpensive, plus the very long expected lifespan is a bonus for people who don’t plan on upgrading their PCs too often. It’s about as thin as an SSD can reasonably be expected to be, plus it’s bootable. If you’d like a solid M.2 SSD for everyday use, take our word for it, you won’t regret buying the MD Blue. 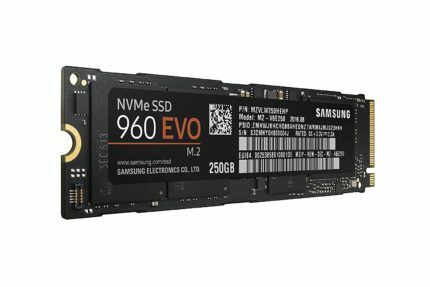 The Samsung 960 EVO Series 250GB is a mid-budget, PCIe-based M.2 SSD that offers blisteringly fast data transfer, outstripping its rivals by a wide margin. Even better, it uses cutting edge NVMe technology to streamline data operations and reduce access times. This SSD uses V-NAND memory, which, simply put, reduces the complexity of writing data in order to boost write times. As there’s less work to do, it also reduces the power consumption of the drive considerably – Samsung claims that it’s up to 45% more energy efficient than traditional NAND storage. You can read data at a staggering 3.2GBps and write it at up to 1.5GBps, so this SSD is perfect for situations where you need a lot of information to be read as quickly as possible. As such, it’d be great for use in a powerhouse gaming PC or even for storing data intensive programs like Adobe Photoshop on. If your PC is decent and you install your operating system on this drive, you can go from pressing the power button to the desktop in under ten seconds – less time waiting, more time doing. This model has the same length and height as all the others we’ve seen, but is a little thicker, at 0.9”. This shouldn’t make too much of a difference unless you’re using it in a build where space is extremely tight – but to be honest, if you can’t fit this in, you probably need to rethink the build. It weighs just a third of an ounce too, which is about standard for these SSDs. Like the BPX, this model does get rather hot when in use, but Samsung have confirmed that it’ll be just fine as long as it’s under 158°F (70°C) – maybe install an extra fan to improve your airflow if you’re concerned about it overheating. It also has a dynamic thermal guard built in to minimize the danger of any damage from this, though, so don’t worry about it. Samsung expectss this product to last for about 100TB worth of data writing. This is lower than some of the less expensive products we’ve already reviewed, which is a little disappointing, but think of it this way – that’s enough to survive writing 273GB of data every day for a year. They also provide a three-year limited warranty which covers defective products and any faults that you didn’t cause, which is always good to see. With this product, Samsung provides their “Magician” software which functions in much the same way as WD’s. It shows the overall status of the drive and serves as an early warning system for drive failure. They also include free drive cloning software, so you can copy all your existing data over to the SSD and get up and running as soon as possible. This is a huge bonus, especially considering that if you search online for drive cloning software, you’re likely to download a whole bunch of malware. When you take into account this product’s incredible read/write speeds, it becomes clear why Samsung have become such a prevalent name in the tech industry. It does have a lower capacity than similarly priced M.2 SSDs but makes up for it by aiming for quality over quality. 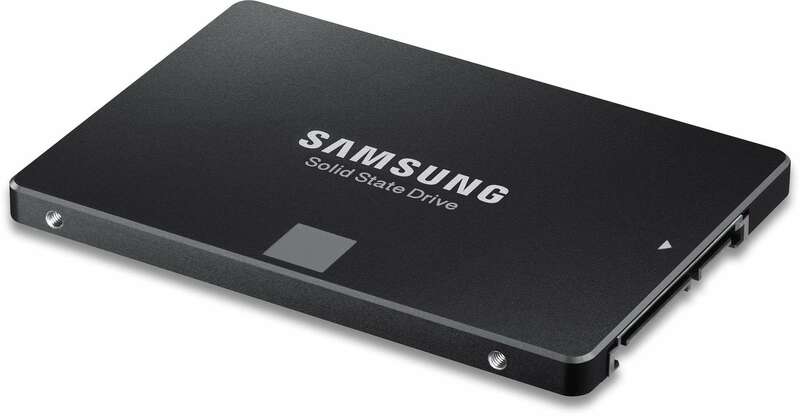 Samsung’s drive management software is actually useful and simple to use, their drive lifespan respectable and their price point reasonable – if you favour high speed over high capacity, this is the SSD for you. The Crucial MX300 is a high capacity M.2 SSD which comes with various speed enhancing features to improve its performance compared to other SATA-based SSDs. It can read up to 530MBps and write 510MBps of data, making it pretty similar to the WD Blue in terms of data access, however, it has a much larger capacity at 1TB. As such, it does have a more substantial price tag, but as M.2 SSDs are relatively new, this is to be expected – this is one of the fastest, largest SATA-based SSDs around, after all. This model is very energy efficient – it’s actually up to 90% more efficient than a traditional hard disk drive, using just 0.075W of power compared to the average consumption of 6.8W. This helps keep your energy costs down and might help you justify the cost of the SSD itself. Crucial have rated the life of this product at around 220TB of data. This is a huge amount of data when you think about it – you’d have to completely fill the entire drive 220 times before it failed. We’re willing to bet you haven’t written 220TB of data since you got your first PC! This drive uses 3D NAND technology to simplify the underlying data transfer processes, resulting in faster data transfers, which can only be a good thing. It, like the MyDigitalSSD BPX, uses 256 bit AES encryption to keep your data secure and prevent it from being accessed by any unauthorized users (just make sure to enable drive encryption sooner rather than later). As M.2 SSDs do have a tendency to get hot quickly, this model includes adaptive thermal protection mechanisms which dynamically adjust the activity of various components to prevent it from overheating and causing damage to itself. However, this is no substitute for a good cooling system and will really save you trouble in the long run with all of your components, not just your hard drive. Crucial provide free access to their Storage Executive software. This allows you to both monitors and enhances the overall performance of your drive by enabling their Momentum Cache feature. This improves the burst performance of your SSD by using system resources that are currently idle and is really simple to set up. Storage Executive also allows you to update the firmware of the drive, which is always recommended for the smoothest performance. This SSD can be used as a boot drive by most modern motherboards, however, you will need to format it first. We were a little disappointed by the lack of supporting documentation for this product – the box includes the drive only and you’re expected to find the manual online if you run into trouble. Similarly, the software is only available from Crucial’s website and does not come on a CD, so internet access is a must, at least when setting up this product. That said, there aren’t a whole lot of faults with the MX300. It’s definitely one of the faster SATA based M.2 SSDs thanks to its various speed enhancing features, plus let’s face it, it’s going to take a while to fill. The built-in thermal protection and drive security features are invaluable and give us confidence that this drive will survive the stress that comes with day to day usage, plus it comes with a three-year warranty, so if it doesn’t, you don’t have to pay for a replacement. You can tell with one look that the Plextor M8Pe isn’t like the other SSDs we’ve seen so far. Whilst most other M.2 SSDs have a relatively plain printed circuit board, this one has covered it with red and black cooling fins which are designed to appeal to pro-gamers or hardware enthusiasts. The heatsink is made of cast aluminium and the front triangle lights up when the computer is booted, with the outer LEDs flashing when in use. We’ll admit it – it is an attractive drive, but what we’re really interested in is how well it performs. Is it a case of style over substance? Thankfully, no. This is a very fast drive, with data being read at 2GBps and written at 1.4GBps – this is slower than the Samsung 960, so why does it have a higher price? Well, for a start, it has four times the capacity (250GB vs 1TB) and on top of that, it has a range of advanced features which allow it to read or write more data with less effort. This model uses NVMe technology to speed up the underlying processes required for data transfer, and as a result sees significant speed increases over models which don’t have this functionality. It also uses an LDPC error correcting algorithm to ensure your data doesn’t get corrupted as it’s moved from one location to another. This gets pretty technical, but simply put, it can automatically fill in any missing parts of a file with the right data. The M8Pe weighs just half an ounce and has a small size – just 3.1×0.2×0.9”. This is in line with the other M.2 SSDs we’ve reviewed so far, but whilst you can use this product on a mobile device, we can’t help but feel it might be better suited to a clear sided desktop PC thanks to its high-tech appearance and LEDs. Plexor provide a five-year limited warranty with this model, which is great to see – nothing instills confidence in a high-end product like a very long coverage time. The expected lifespan of this drive is a massive 768TB, which means you could write 420GB a day for five years before it failed. This far exceeds the lifespan of any other SSD we’ve reviewed today and is almost worth the added price on its own. Plexor claim that this model is aimed at the pro-gamer market, and we can see why. The high read time speeds allow for faster data loading and as a result, less lag or stuttering in games which are installed on the SSD. In competitive situations, where actions are time to the millisecond, this can be the difference between winning the competition and failure. With prize money often in the hundreds of dollars, it’s obvious that these users would want the smoothest experience possible. In short, this product is more expensive because it has a far longer lifespan than most other SSDs and because it’s primarily aimed at the enthusiast market. It looks fantastic and has very fast data transfer speeds, so what’s not to like? If you don’t mind spending a little more money to get a hardy, high-performance drive, go for the Plexor M8Pe. Buying an SSD can be a daunting experience, and doubly so if you’d like an M.2 product since they’re pretty new and therefore, store sales staff might not know enough about them to help you out. Thankfully, we do, which is why we’ve put together a short guide to the most important considerations you should make before buying an M.2 SSD. The first and arguably most important thing you should check is the connection of the M.2 SSD. This will have a certain number of notches on the base of the card – you’ll need to ensure that you have either a free PCIe slot and M.2 adapter, or an M.2 slot on your motherboard with the same number of notches. One notch in the card means it’s a PCIe based SSD which achieve far higher speeds than the two notched or SATA based models. Non-Volatile Memory Express (NVMe) enabled drives usually have far higher performance than models without. Simply put, this is technology that allows the SSD to process multiple tasks at the same time, however, these cards are usually a fair bit more expensive. If you currently have a traditional hard disk drive, even a SATA based SSD is likely to improve your read/write times by around 400%, with high-end PCie based drives delivering a massive 1000+% improvement. That said, if you are currently using a SATA connected SSD, you won’t see any significant speed increases by switching to a SATA based M.2 SSD, and would need a PCie model. What do you plan to use the drive for? SSDs excel at providing super fast data access, so there are some real benefits to installing your operating system on one, but they can also be used for data-intensive applications like Photoshop, computer aided design or data-science. If you’re just looking for a drive to store your stuff on, you won’t necessarily need the drive with the fastest speeds, and might benefit from getting a drive with a high capacity instead – 500GB or more will ensure you have plenty of room. If you plan to consistently write lots of data to the drive, take a look at the lifespan of the SSD. This will be in terabytes and gives an indication of how much data can be written before it is at risk of failure. You may also want to consider buying a device with a long warranty period, just in case, although these tend to only come with the more expensive models. If you’re looking to speed up an older system, bear in mind that some motherboards won’t have an M.2 socket, and you’ll need an adaptor to use the SSD. It’s also worth noting that the motherboard may have an older version of SATA – the drive will still work but will be limited to a certain speed and as such, won’t work at its full potential. There’s a pretty good explanation here: https://kb.sandisk.com/app/answers/detail/a_id/8142/~/difference-between-sata-i%2C-sata-ii-and-sata-iii , if you’re interested in finding out more. M.2 SSDs are a relatively new technology, but that doesn’t mean they have to be confusing. We’ve highlighted six of the best models around and decided that the MyDigitalSSD BPX is the best option for most people. 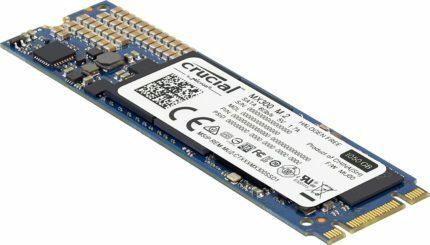 It’s a reasonably inexpensive, superfast, sturdy SSD with a lot of useful built-in features and will last for years without failing. We hope that this article has helped demystify M.2 SSDs for you, and with a bit of luck, you may even have found a product you like. If so, we’d ask you to consider us the next time you need product advice – we’d love to help you again. Thanks for taking the time to read this, and have a great day.